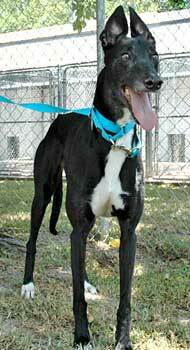 Jacque, aka Jax Cocoa, is a very beautiful 4-year-old black female born July 14, 2001. Jacque's sire is Be Complete and her dam is GM's Playmate. She has been on the racing circuit from May 7, 2003 starting in Phoenix, moving to Interstate and Apache Junction, and then finally ending her career on May 7, 2005, in Tucson. Jacque's sleek black coat and striking white tuxedo and white feet give her quite a stunning appearance. Jacque is cat and small animal trainable. 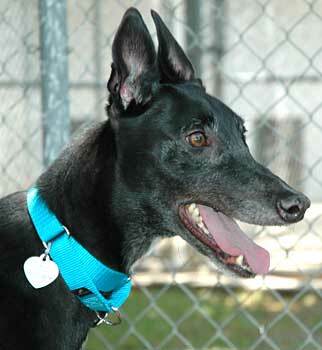 Jacque is a beautiful, well-mannered girl with personality to spare. She is quite cat-trainable, so don't let the alertness at first meeting fool you. Those ears standing straight up and close together are just her good-natured curiosity. Nothing shy about this girl! She still watches the cats, but allows them to move about unscathed. Jacque was so inquisitive about her new surroundings, that she even climbed into the bathtub to check things out behind the shower curtain! She gets along with with the other dogs in the home, and is just a well-mannered little guest. Whoever adopts her will be welcoming lots of laughter and love into their home.